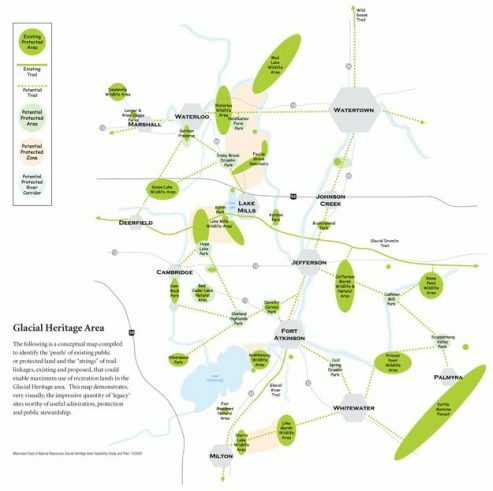 This unique project is designed to reconnect people to the land through recreation, conservation and tourism. By using a “strings and pearls” approach, the project aims to increase the diversity of recreation opportunities, which includes hiking, biking, wildlife watching, camping, horse riding, hunting, fishing and other activities where people live and work. There are four main focus areas: Conservation Parks; Linking Trails; River- based Conservation Area; and Wildlife Areas. Although the area is mainly centered in Jefferson County, GHA also includes parts of Dane, Dodge and Rock counties covering 26 towns in the four counties. Some of the properties that have already been protected in the area include Aztalan State Park, eleven large State Wildlife Areas, twelve State Natural Areas, the Glacial Drumlin and Glacial River trails, numerous County Parks and several areas owned by private conservation groups. The Glacial Heritage Area is uniquely situated between Madison and Milwaukee – within 50 miles (about a one-hour drive) of approximately half the state’s population. The current demand for nature-based activities is already high and continues to increase. Wisconsin’s population is increasingly urban and suburban and is looking for readily accessible places to hike, bike, fish, watch wildlife, camp, hunt, ride horses, cross country ski and other outdoor activities. For more information on this project, locations and activities offered within the Glacial Heritage Area, go to www.glacialheritagearea.org.